Yesterday was the longest day of the year in the northern hemisphere, the Summer Solstice. 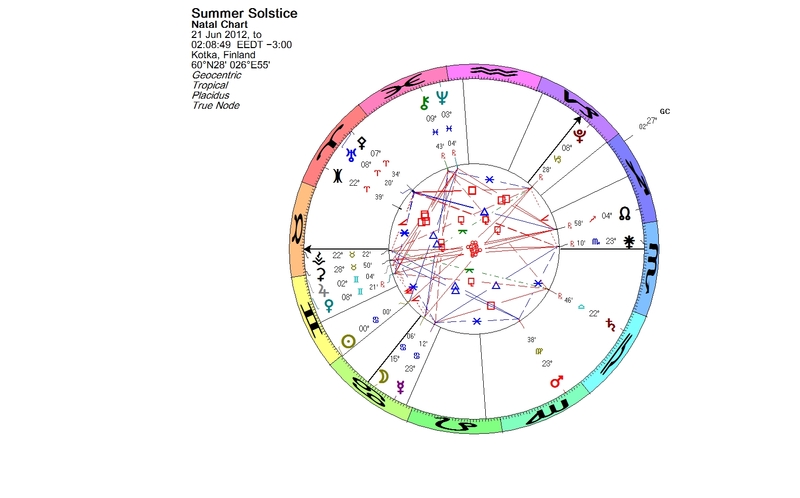 The Sun ingressed into Cancer on June 20, 11:09 pm UT. A new phase, a new season is about to begin. A lot has been going on in Gemini lately. Just prior to the solstice we had a New Moon in the late degrees of Gemini, just opposite the Galactic Center. 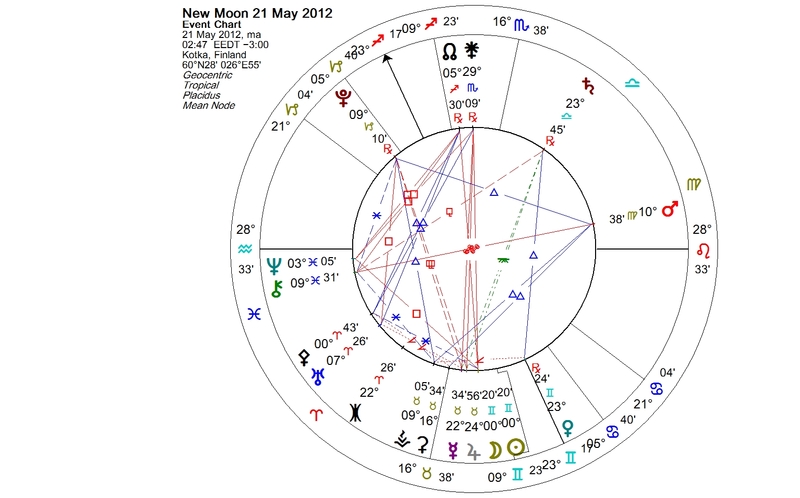 The Solar Eclipse of May four weeks ago fell also in Gemini, in the first degree of the sign. Then, two weeks ago, the rare and spectacular Venus transit occurred in the middle of the sign. Jupiter, the planet of expansion, has just changed signs from Taurus to Gemini. A reflection of the recent heavenly movement was seen in Oslo during last weekend, when the Burmese opposition leader Aung San Suu Kyi accepted the Nobel Peace Prize, which she won 21 years ago, and was finally able to deliver her acceptance speech. She was awarded the Nobel Prize in 1991 for her non-violent struggle for democracy and human rights. She is said to be an outstanding example of the power of the powerless. Suu Kyi was released from house arrest in Burma in November 2010. She remained under the arrest most of the years between 1989 and 2010, being one of the world’s most prominent political prisoners. She was not able to travel to collect her Nobel Prize in 1991. Her current trip to Europe is her first in 24 years. 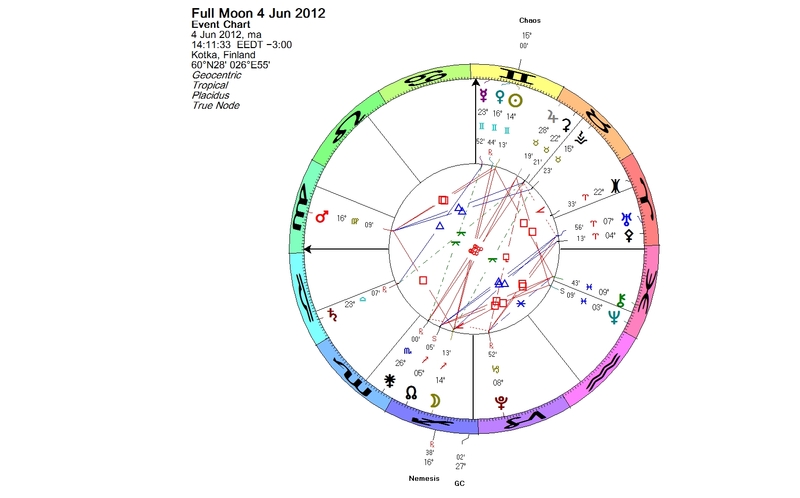 Suu Kyi is a Gemini, she just had her solar return. She was born with her natal Sun in line with the Galactic Center. 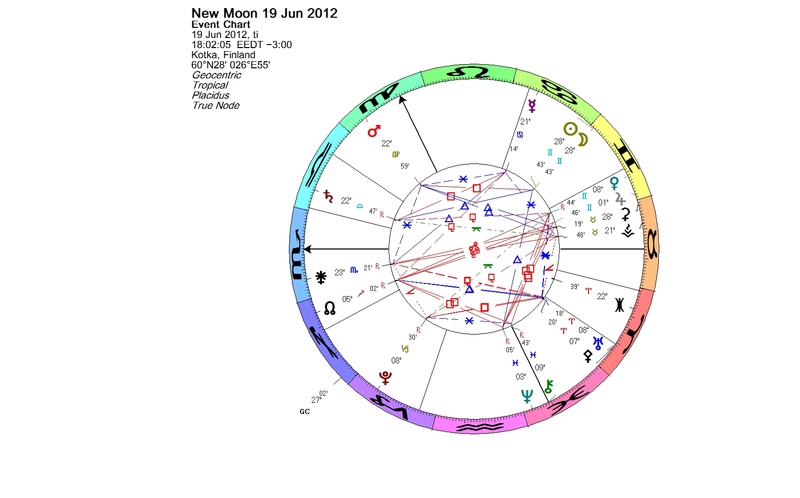 Besides her Sun, she has Uranus in Gemini in her birth chart (the time is unknown). The Sun is square Chiron. Suu Kyi is a values leader. Her Venus (values, peace) is strong in her own sign, Taurus (values). Venus is in conjunction with Mars (leadership, courage) and asteroid Nemesis (conscience). 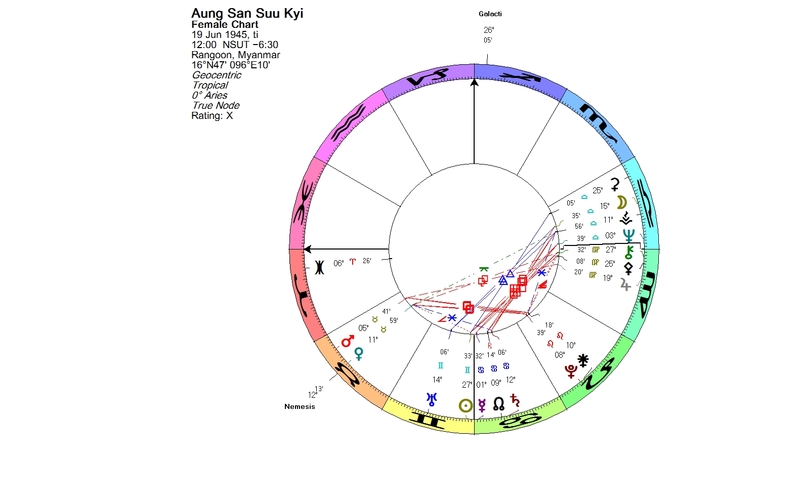 The recent activity in Gemini has touched Suu Kyi’s planets directly. The Lunar Eclipse two weeks ago transited her natal Uranus tightly. 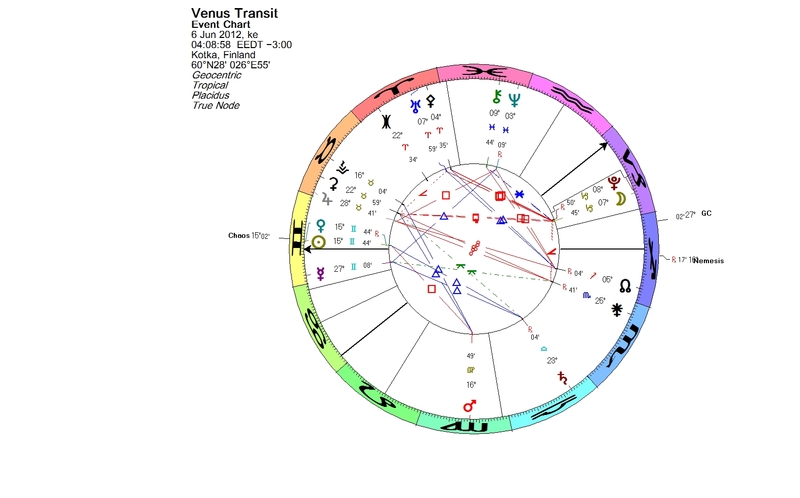 Also the Venus transit happened right on her Uranus. The New Moon three days ago fell on her Sun. *) The U2 song “Walk on” is written about and dedicated to Aung San Suu Kyi. We have just passed the Venus transit, a rare event which we won’t get a chance to witness again in our lifetime. This was preceded by a Lunar Eclipse in Sagittarius the day before. Venus transits occur in pairs, separated by eight years. These pairs are separated by about 105 or 121 years. The last time there was a transit of Venus was in 2004. The event is so rare, because the orbits of Venus and Earth do not lie in the same plane, and a transit can only occur if both planets and the Sun are situated exactly on one line. There has been such hype around this event that your expectations may run high for something exceptionally beautiful or enlightening to happen. The Sun is now conjunct Chaos, so your life may not be filled with peace, love and beauty of Venus at the moment. I was delighted to notice that asteroid Nemesis is in Sagittarius opposite Venus. In Greek mythology, Nemesis was the goddess of divine retribution who maintained the equilibrium of the human condition. The word Nemesis originally meant the distributor of fortune, neither good nor bad, simply in due proportion to each according to what was deserved. I have always loved Demetra George’s interpretation for asteroid Nemesis as a symbol of our conscience. According to her, asteroid Nemesis shows how our conscience and morality guide us toward right action. The symbol of Venus, a circle with a small cross below it, resembles a hand mirror. You can think of the current situation of Venus opposite Nemesis, as if you were facing your conscience in a mirror. Whatever your life situation is at the moment, if you follow your conscience, you can’t go wrong. You are currently browsing the Lunations by Kirsti Melto weblog archives for June, 2012.